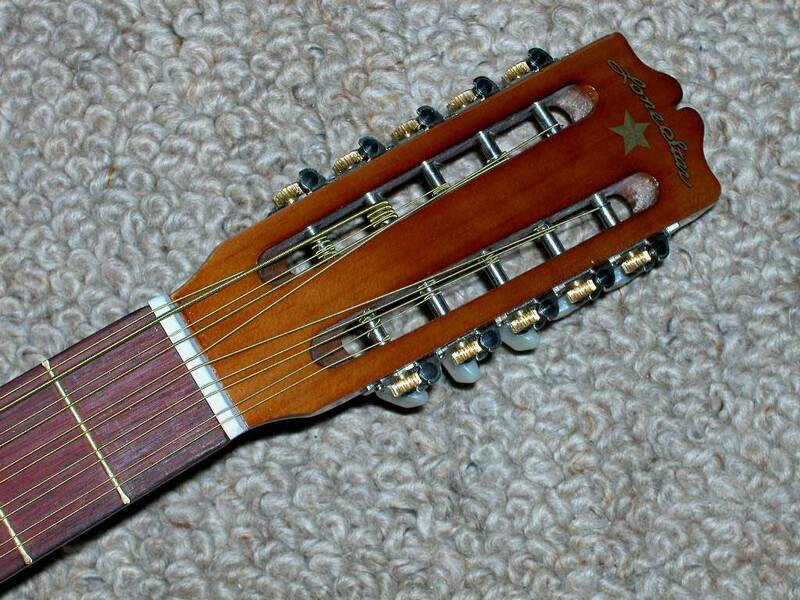 BAJO QUINTO - LONE STAR The Bajo Quinto is a ten-string guitar. 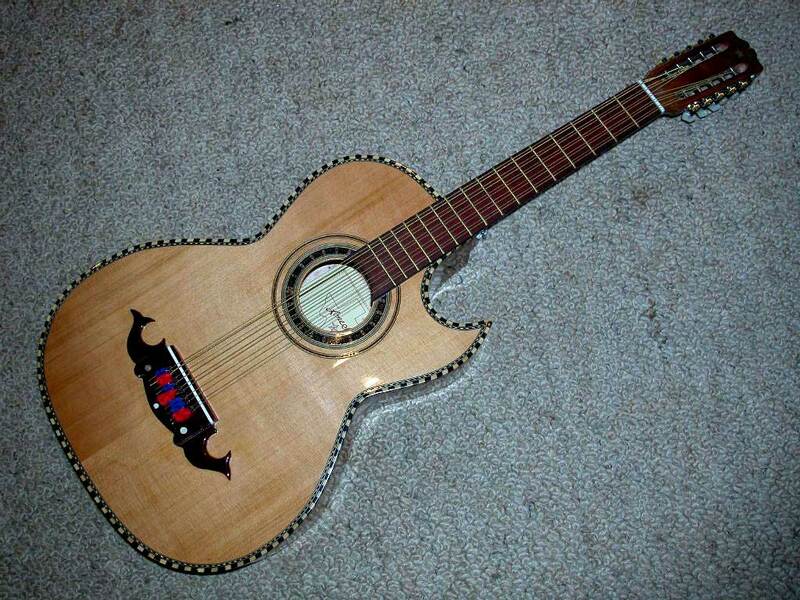 Built in Mexico, 2004. This is a brand new instrument from "Lone Star". 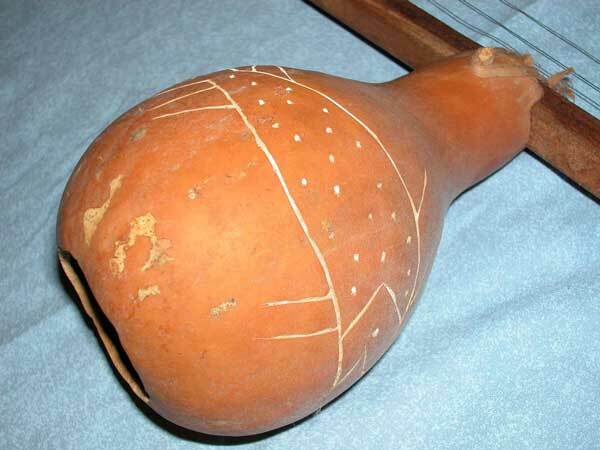 This is the rhythm instrument for a conjunto group that plays music from the northern states of Mexico. The bajo quinto player plays the bass and the chord accompaniment for the button accordion. 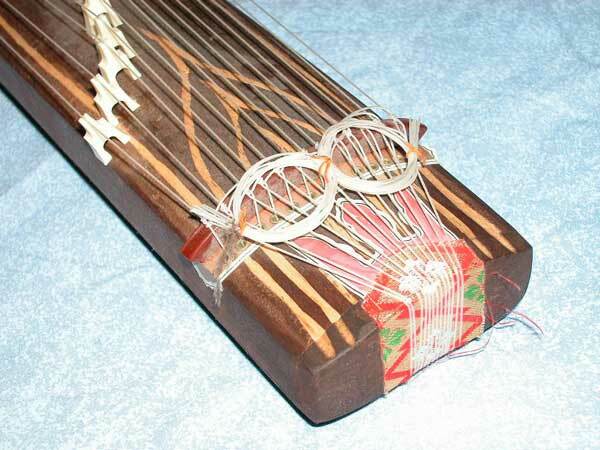 The top four strings are used to play the bass while the lower six play the chords. The unique blend of the double strings playing octaves give the instrument the very strong bass sounds heard in the conjunto. 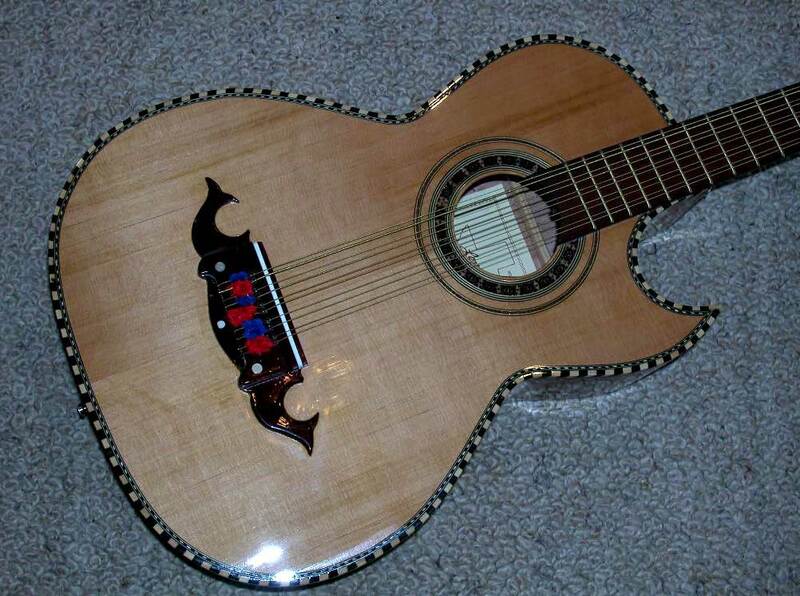 CUATRO 10 STRING 10 string Acoustic Guitar. Built in Puerto Rico, 1980's. 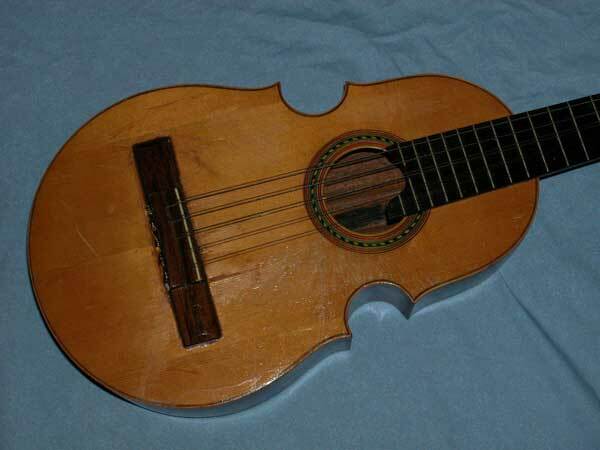 The Cuatro is the National Instrument of Puerto Rico and is the descendant of similar Spanish guitars. 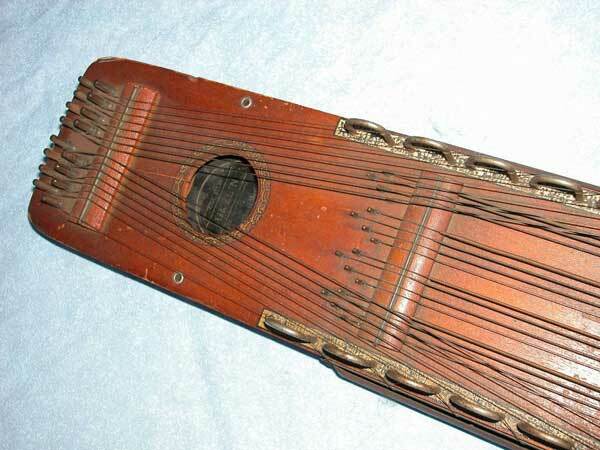 This is a very nicely crafted instrument that is in good structural condition, but is in need of a refinish, (some previous owner attempted to refinish it and did a very sloppy job). Additionally, the bridge coud use a re-set to clean up a sloppy glue job. 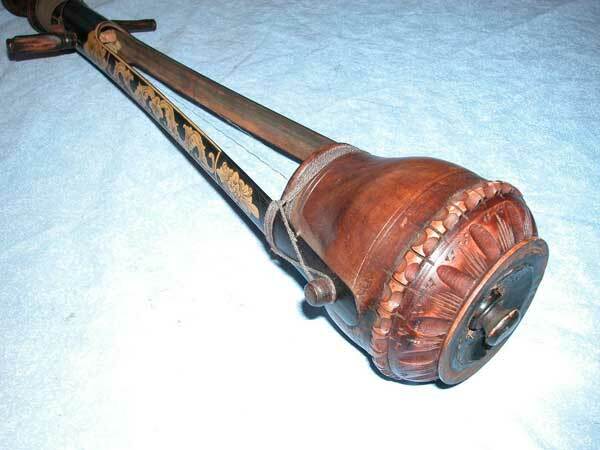 Generally a very high quality instrument, in Very Good Condition. No cracks or repairs. 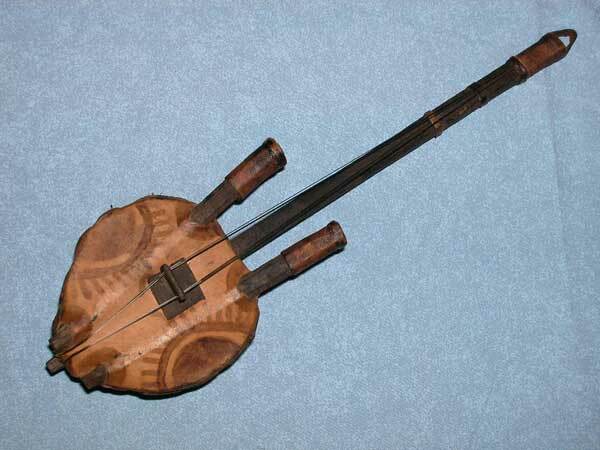 FOLK FIDDLE - BAMBOO 2 String instrument. Built in Indonesia, 1990's. 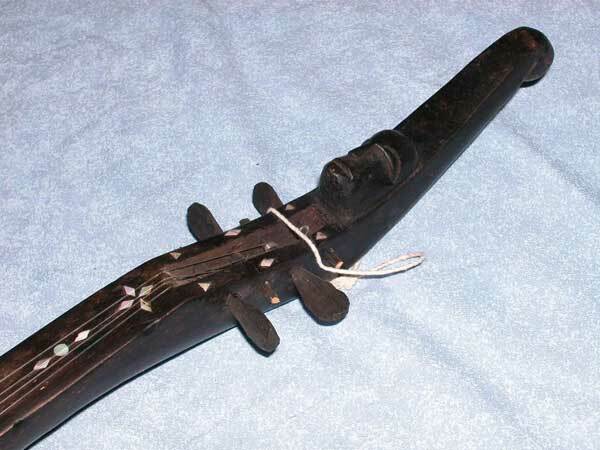 This is a small, traditional Indonesian folk fiddle. Nicely carved figure head and detailed bowl bottom, with detailed carved scroll markings in the bamboo shaft. Bamboo, wood and other natural materials. Excellent Condition with minor crack in bamboo. FOLK FIDDLE WITH BOW Bowed, string instrument. Built in Africa, 1960's. 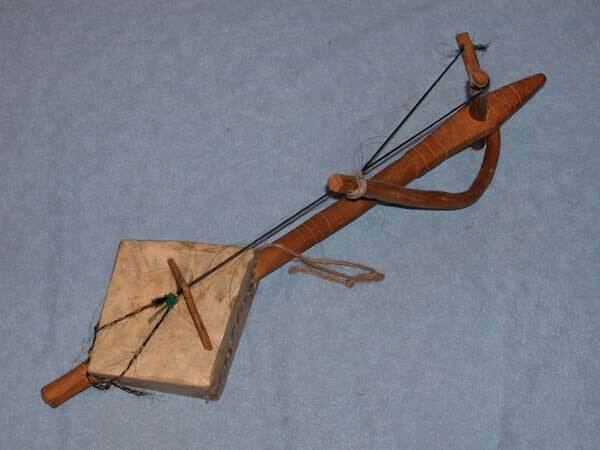 This is a traditional bowed African folk fiddle. Nicely constructed and detailed. 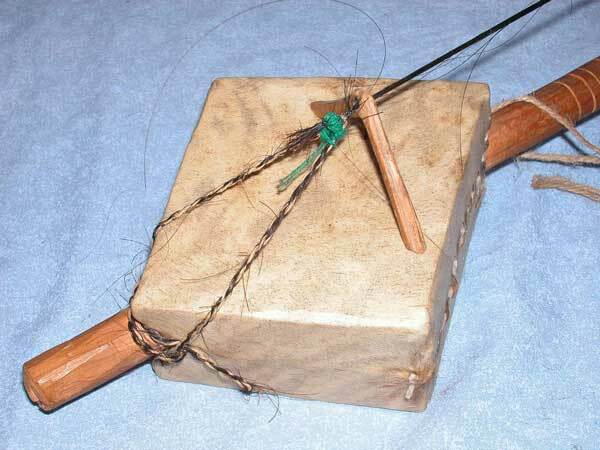 Built with wood, animal skin and other natural materials. Excellent/Mint Condition. 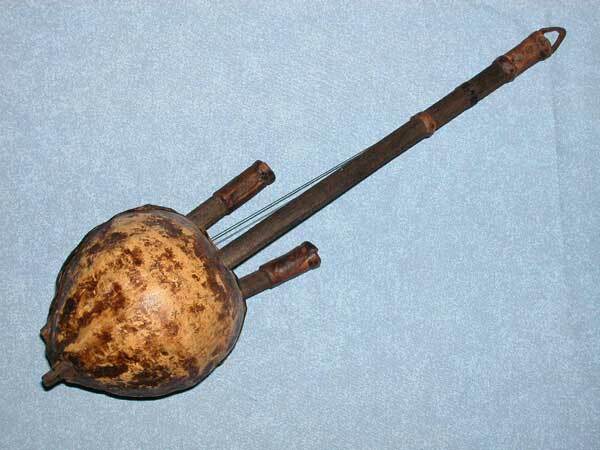 FOLK FIDDLE - SPIKE OR REBAB String instrument. Built in Indonesia, 1980's. 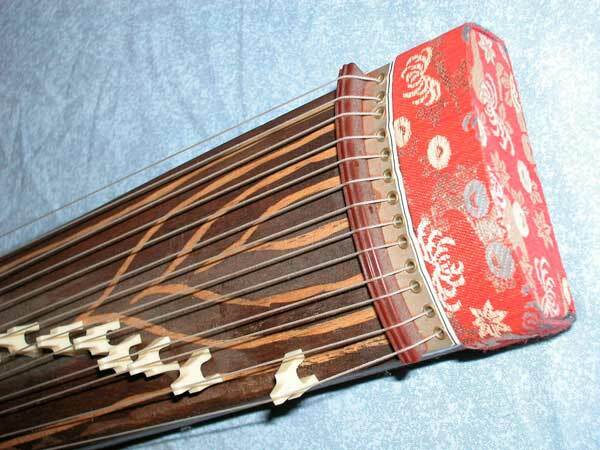 This is a traditional South East Asian instrument, typically found in Malay. Nicely carved figure head with detailed mother of pearl inlay markings. Wood and other natural materials. Excellent Condition. 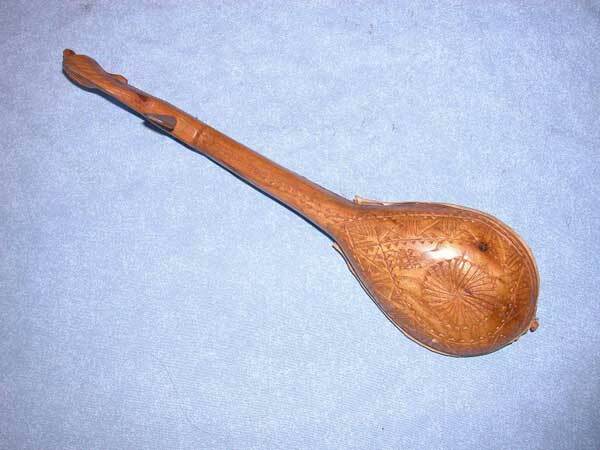 FOLK LUTE String instrument. Built in Africa, 1990's. 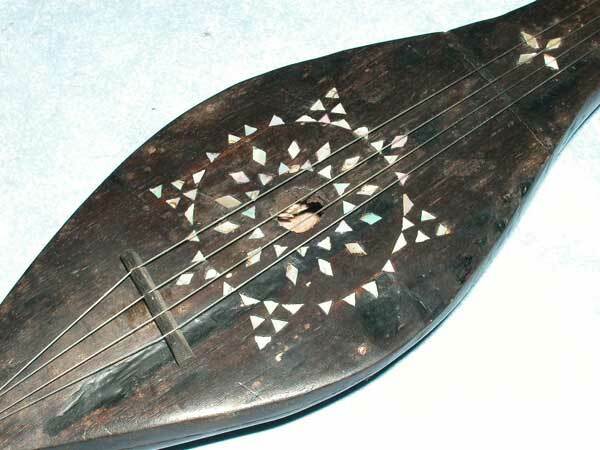 This is a small, traditional African folk lute. Recently built, (appears to be built more for decoration than production of music). 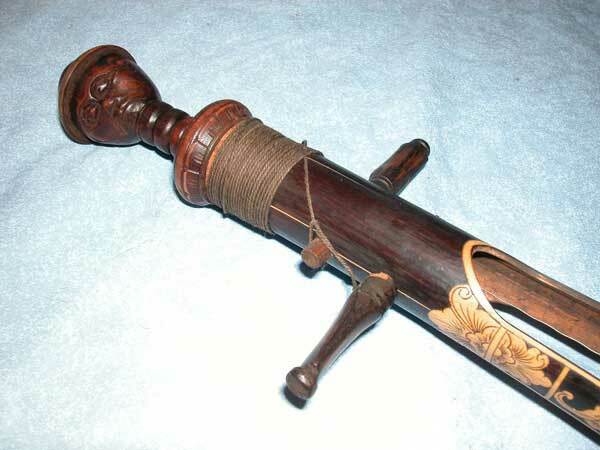 Nicely designed and detailed, with decorative markings, wood, leather and other natural materials. Excellent/Mint Condition. 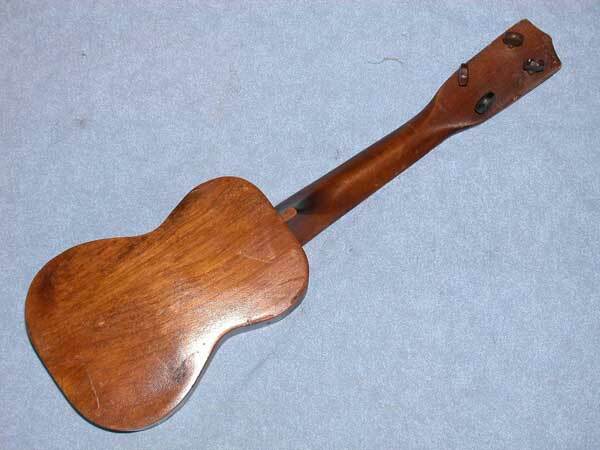 GUITAR-O-LIN Plucked, strummed and bowed string instrument. Built in USA, 1930's. 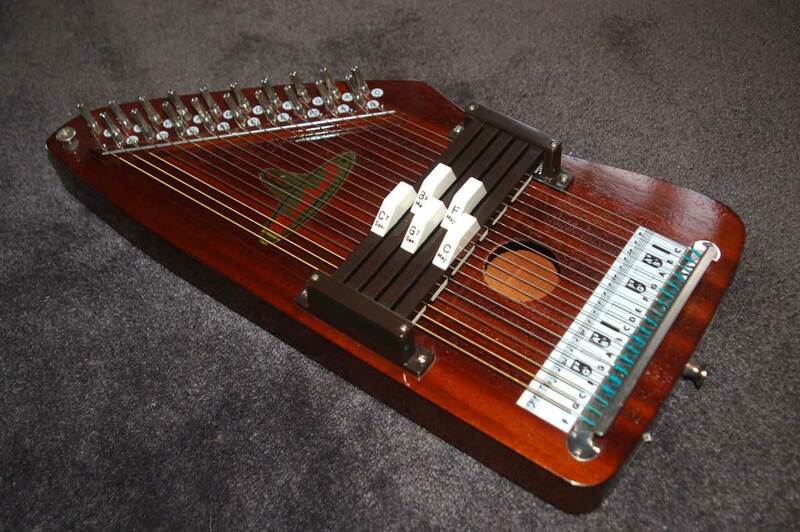 Various versions of these guitar/autoharp hybrids were built and became popular in the 1930's, though I know of nobody who knows how to play them. 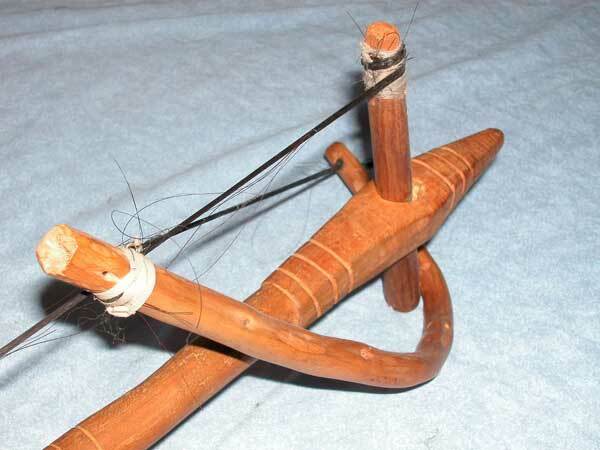 Includes bow and key. Excellent Condition. 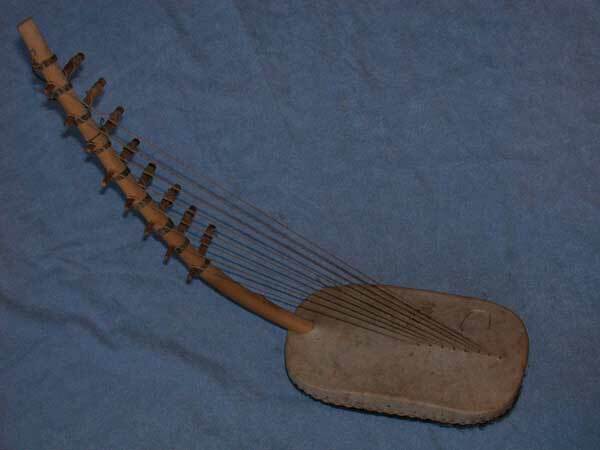 GUSTLE - 1 STRING 1 String instrument. Possibly built in Egypt, 1990's. 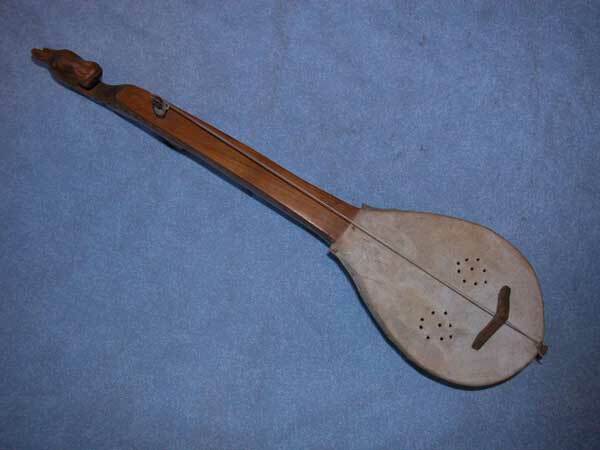 Other possibilities - 'gusle' or 'gusla'--from the former Yugoslavia, most likely Croatia. 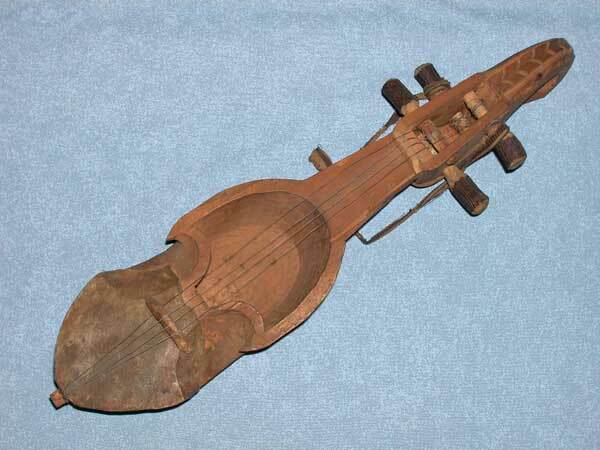 This is a small, traditional folk fiddle. 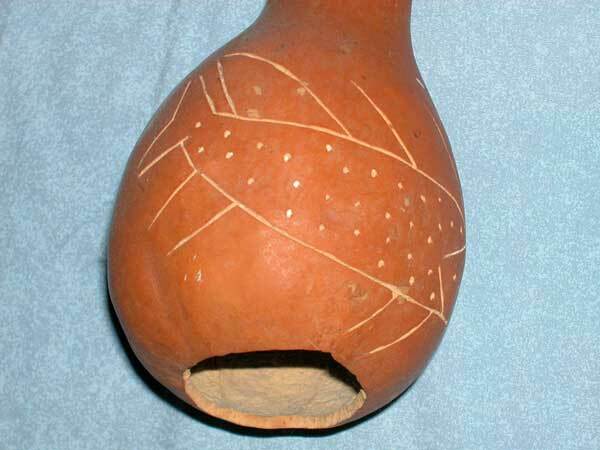 Nicely carved figure head and geometric detailed, with decorative markings, wood, animal skin and other natural materials. Excellent/Mint Condition. 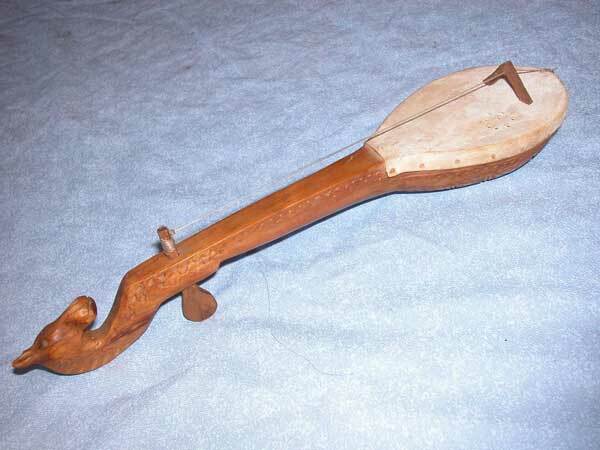 HARP BOW Harp string instrument. Built in Africa, 1980's. 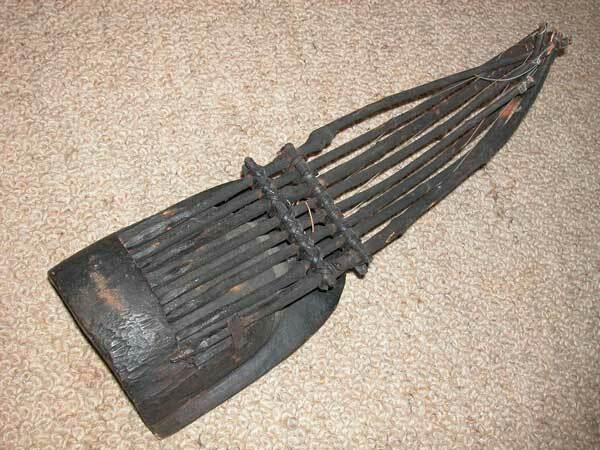 This is a traditional African bow harp. Nicely designed and crafted, with wood, animal skin and other natural materials. Excellent/Mint Condition. 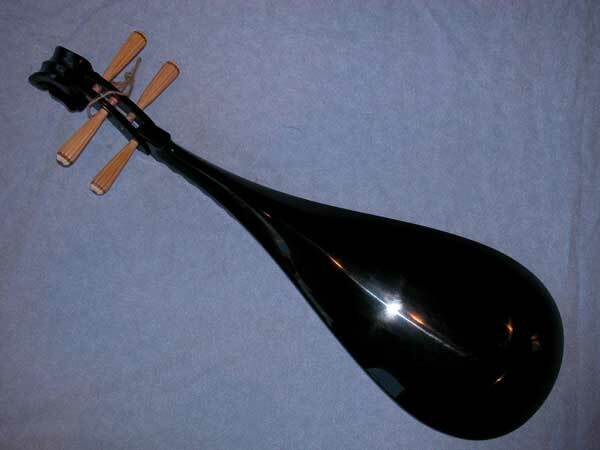 HARP BOW Harp string instrument. Built in Africa, 1980's. 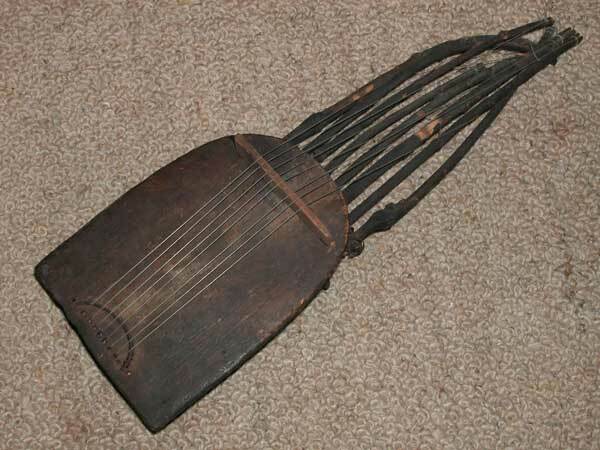 This is a traditional African bow harp. 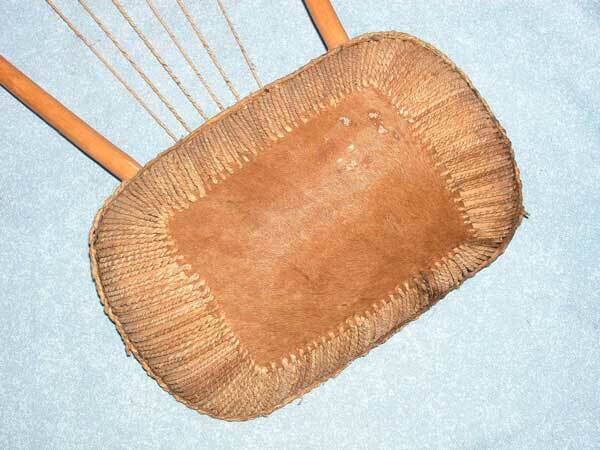 Nicely designed and crafted, with wood, animal skin, fur and other natural materials. Excellent/Mint Condition. 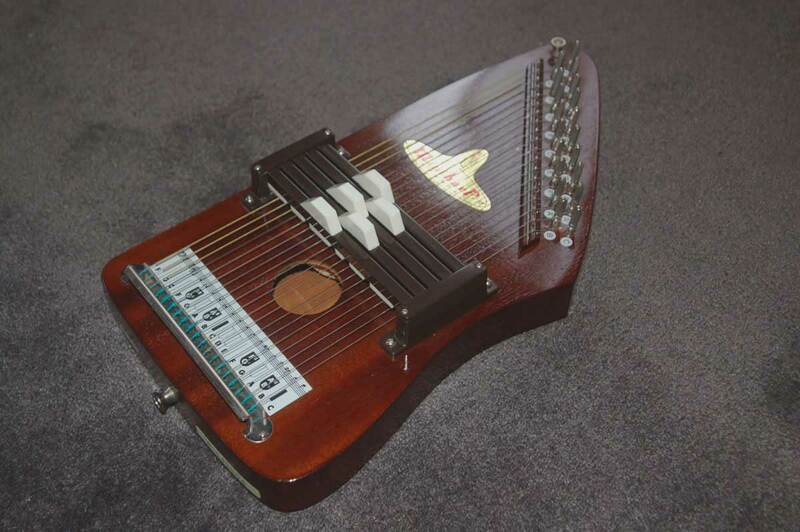 HARP CHROMAHARP Harp string instrument. Built in USA, 1980's. Versatility is the key to the Chromaharp� family. The chord bars enable the player to literally play hundreds of songs. Construction and design feature torsion-tight tuning pins, pre-stressed maple frame, maple top and back with high gloss finish. Excellent/Mint Condition. 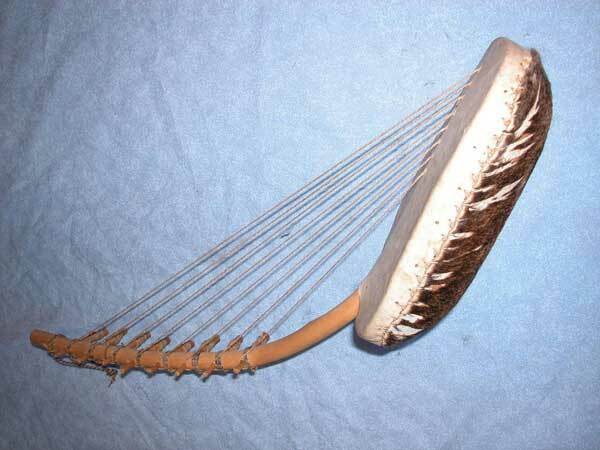 HARP LYRE Harp string instrument. Built in Africa, 1960's. 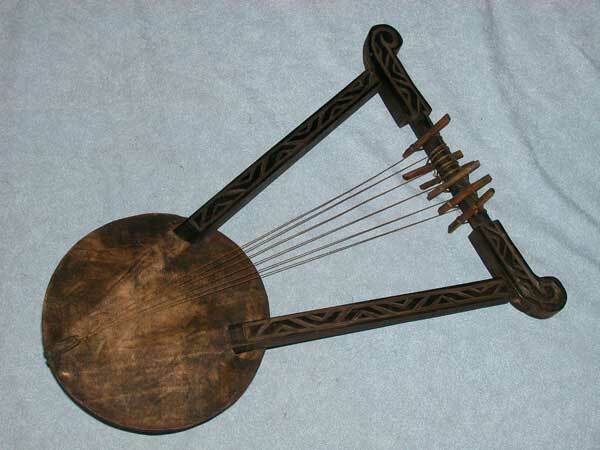 This is a traditional African harp lyre. 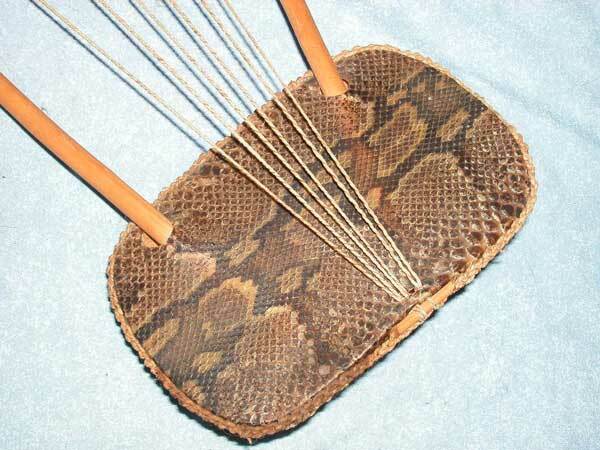 Nicely designed and crafted, with wood, snake skin, fur and other natural materials. Excellent/Mint Condition. 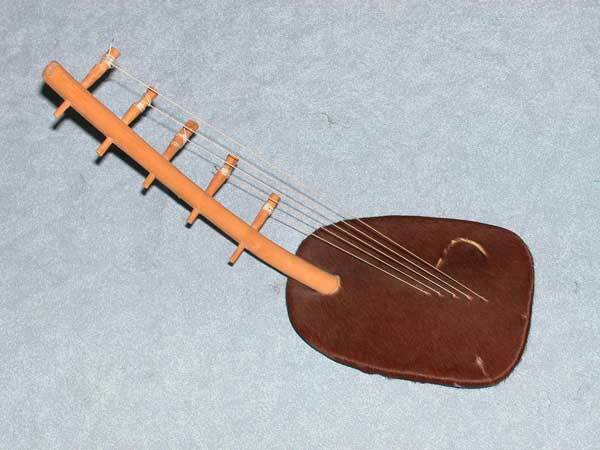 HARP LYRE Harp string instrument. Built in Africa, 1960's. 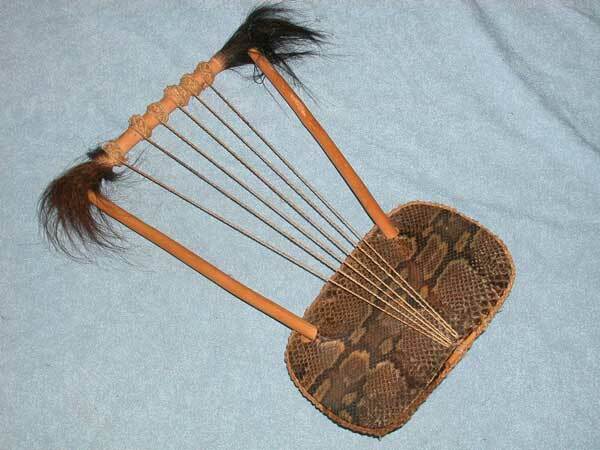 This is a traditional African harp lyre. Nicely designed and crafted, with wood, animal skin and other natural materials. Excellent/Mint Condition. 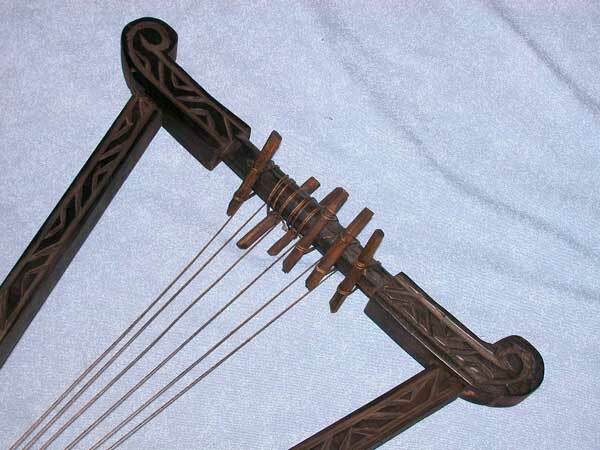 HARP LYRE Harp string instrument. Built in Africa, 1960's. 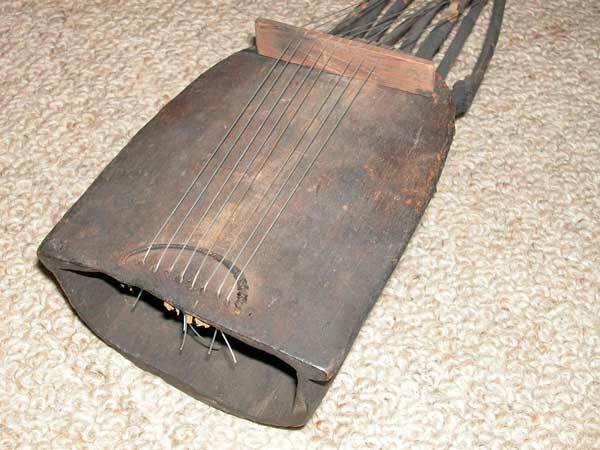 This is a variation of the traditional African harp lyre, constructed from a hollowed out piece of wood as a sound chamber and sticks to create a "neck" . 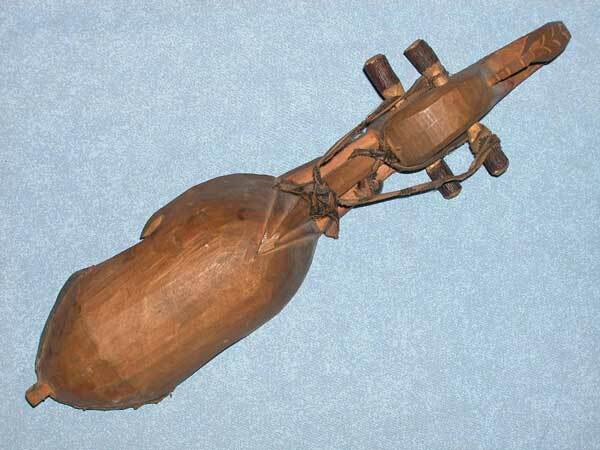 Very unusual instrument. Excellent/Mint Condition. 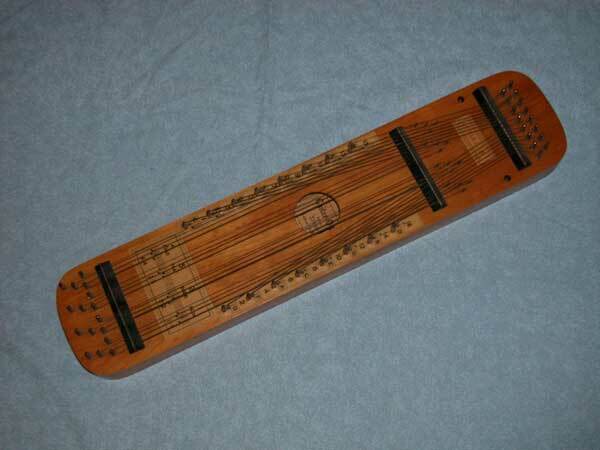 KOTO Plucked, long zither. Built in Japan, 1980's. 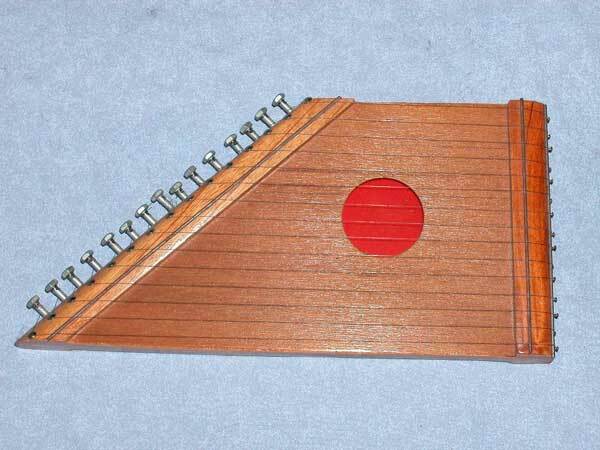 Small scale version of the traditional Japanese instrument, crafted in wood and fabric with traditional decoratoin, (plastic adjustible bridges). Excellent Condition. 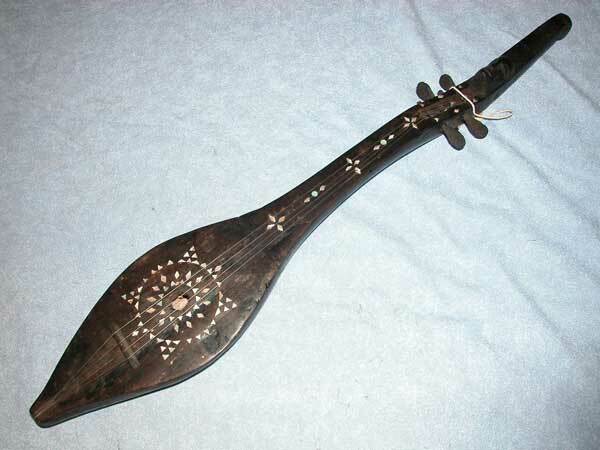 LUBA Plucked, guitar. Built in Africa, 1990's. 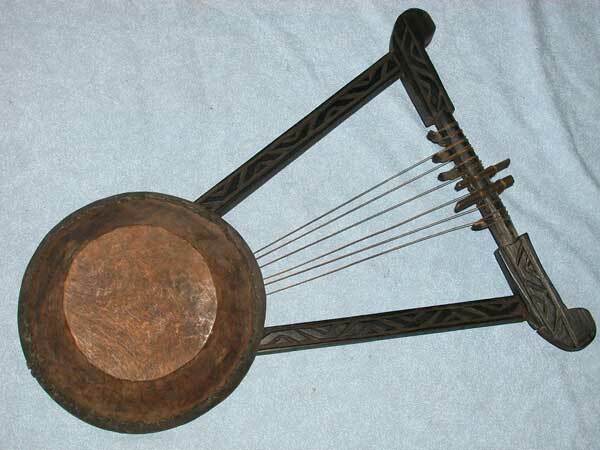 Traditional small scale African instrument, crafted in wood and animal skin. Excellent Condition. 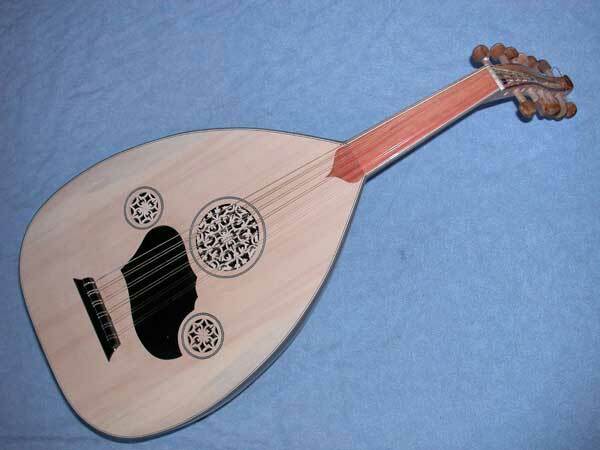 OUD LUTE Fretless large 11 string lute. Built in Turkey, 2001. 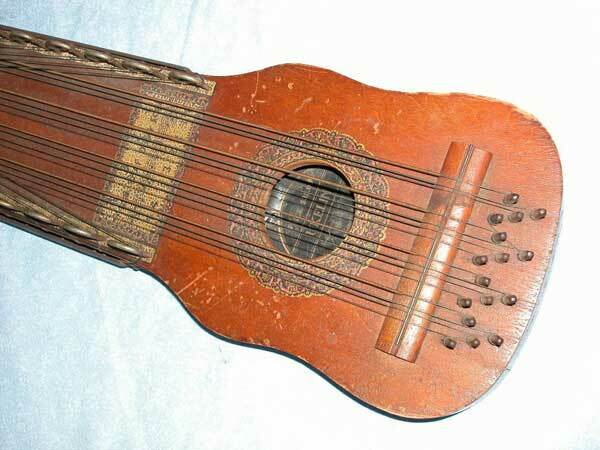 Traditional Turkish fretless plucked or strummed instrument. Nicely crafted, student instrument, in various contrasting woods and finishes. Excellent Condition. Includes soft fitted case. 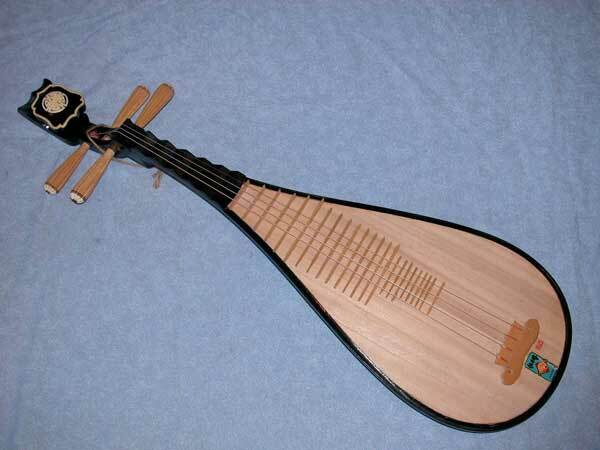 PIPA RUAN LUTE Fretted 4 string lute. Built in China, 2002. 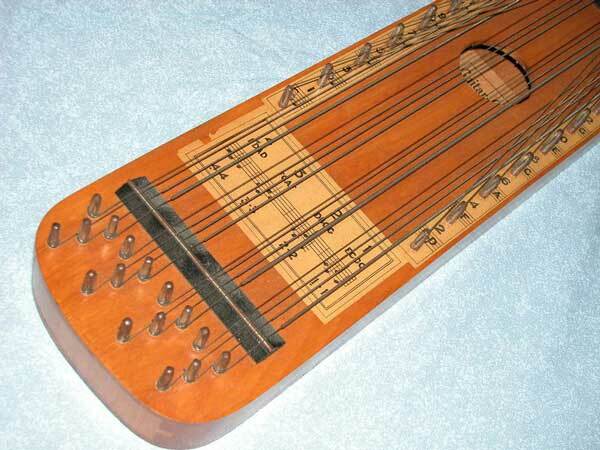 Traditional Chinese fretlted, plucked instrument. 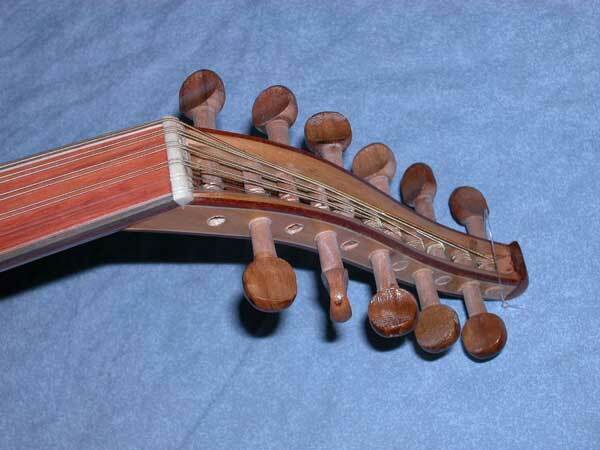 Nicely crafted, student instrument, in natural and lacqured woods. Excellent Condition. Includes soft fitted case. 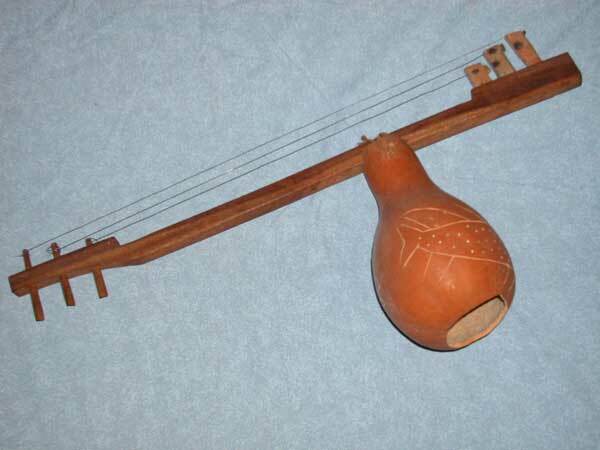 UKELIN Plucked, strummed and bowed string instrument. Built in USA, 1930's, by the International Music Corp. 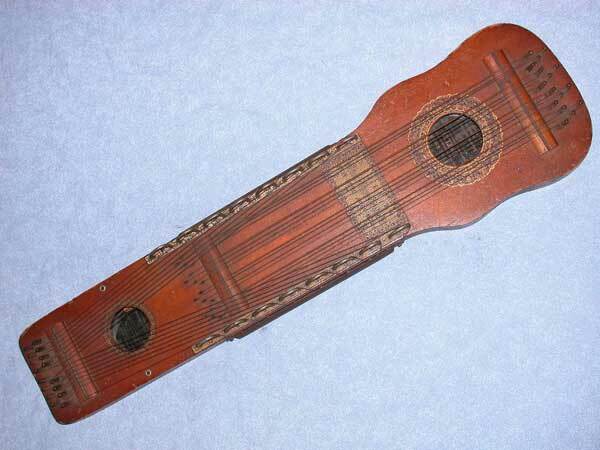 Various versions of these guitar/autoharp hybrids were built and became popular in the 1930's, though I know of nobody who knows how to play them. Very Good Condition. 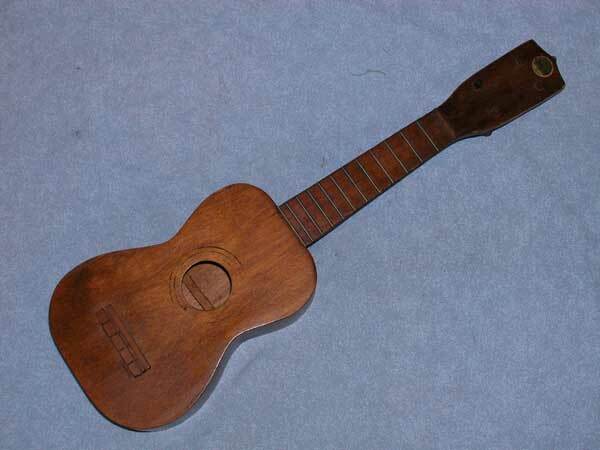 UKELELE Plucked and strummed, the UKULELE is a small 4 string guitar developed in Hawaii in the 19th century . Built in USA by La Karitis in the 1950's. Transparent, natural finished wood construction. Very Good Condition. 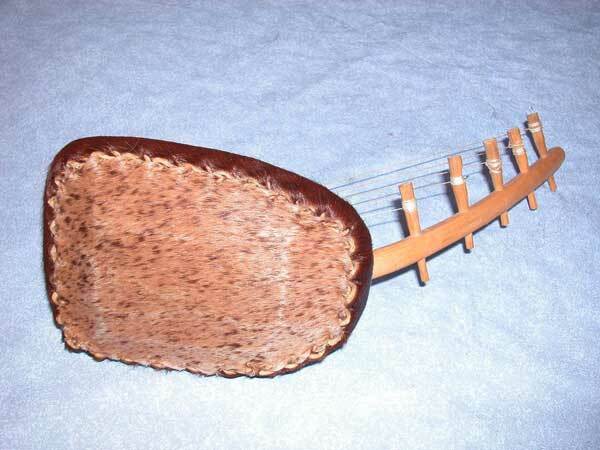 ZITHER GOURD Plucked or bowed string instrument. Built in Africa, 1980's. 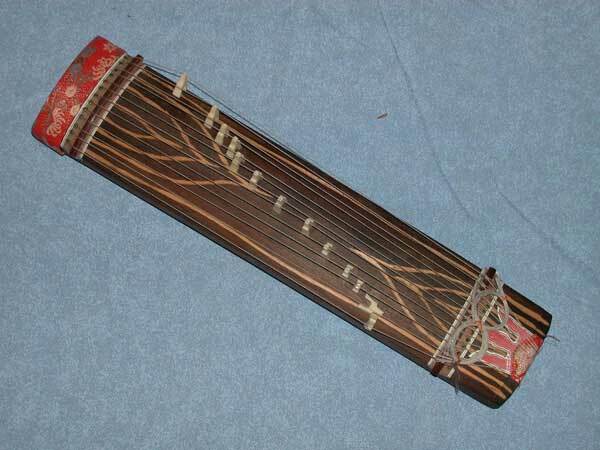 This is a long, traditional African zither, utilizing a tied on gourd to amplify the sound of the strings. Crafted in wood, metal, leather and a natural carved gourd. Excellent Condition. 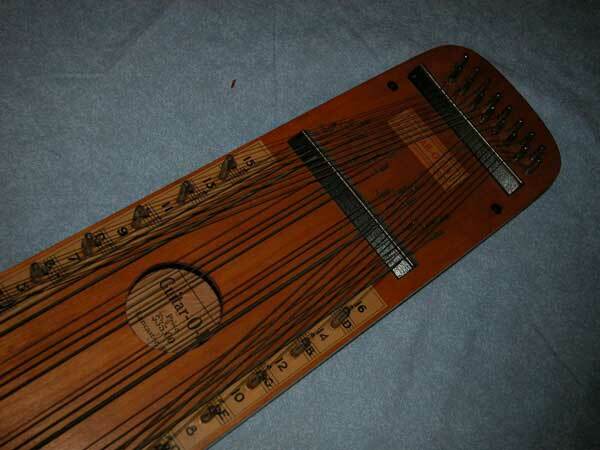 ZITHER Plucked or strummed multi string instrument. Built in USA, 1960's. 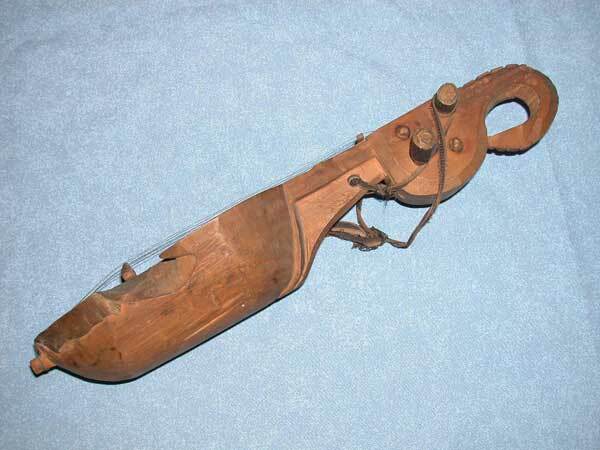 This appears to be a hand built instrument, crafted in wood and metal. Very Good Condition. 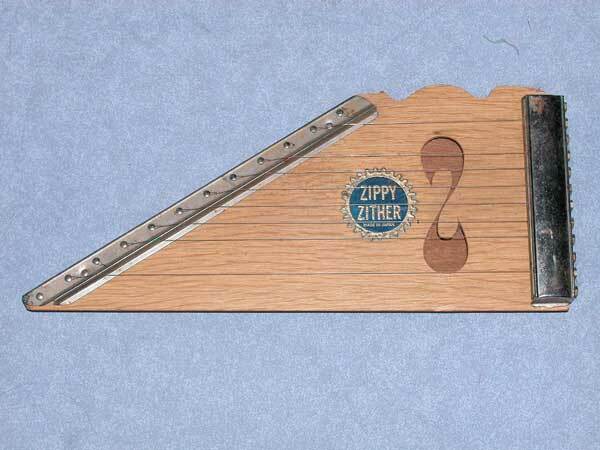 ZITHER, ZIPPY Plucked or strummed multi string instrument. Built in Japan, 1970's. 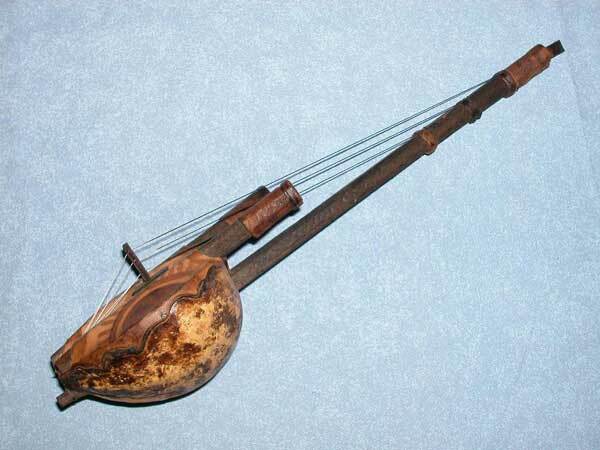 This is a nicely built instrument, crafted in wood and metal. Very Good Condition.